Recently I’ve been hearing about kale on TV, blogs and recipes yet I’ve had quite a bit of trouble tracking a bunch down to try myself. This week my local fruit and veggie store had boxes of it so I had to grab a bunch. I took it home and blended it up with some banana, berries and rice milk and was surprised how delicious this dense, green bunch of leaves were! So…what’s all the fuss about? 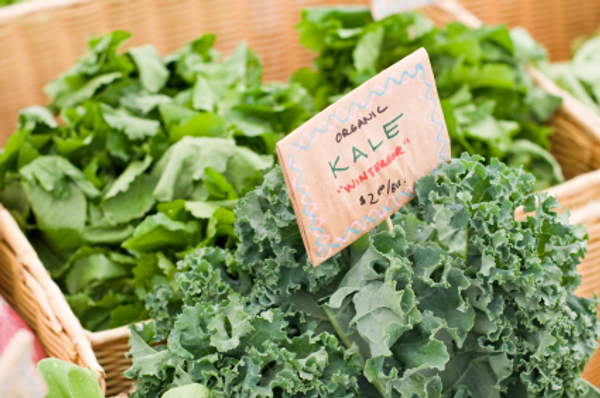 Though greens in general are nutritious, kale stands a head above the rest. Full of antioxidants, calcium and fibre it’s also packed full of essential vitamins protecting your body from free-radicals and strengthening the bodies natural defence system. Kale is very versatile and can be added to your smoothies, juices, salads, homemade dips, vegetable dishes and the list goes on! Just another amazing superfood to add to your market shopping list!